(R B Adam). ENGLISH LITERATURE FROM THE LIBRARY OF MR. R. B. ADAM, BUFFALO, N.Y. TO BE SOLD BY HIS ORDER. New York: The Anderson Galleries, February 15 & 16, 1926. 433 lots. Frontis., text illus. 8vo. Original flexible pebble cloth, spine stamped in gilt, original wrappers bound in as issued (see below). Lathrop Harper's copy, inscribed "For Lathrop, the kindest and best, E. Byrne Hackett." 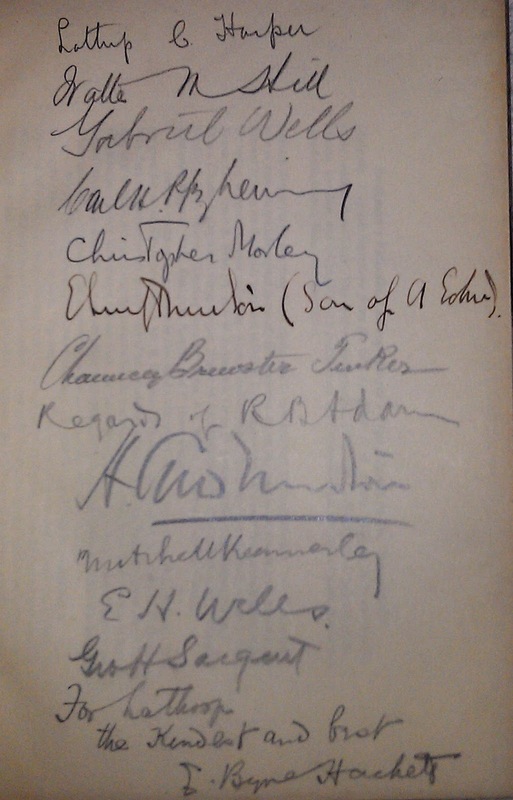 Signed by twenty-five bookmen during the pre-auction dinner party hosted by A. Edward Newton for the highly respected collector, R.B. Adam--one of the most famous such gatherings in the history of American book collecting. Signers include Ralph Isham, Seymour de Ricci, Barnet J. Beyer, Jerome Kern, Louis B. Shaw (? ), A.S.W. Rosenbach, Owen D. Young, William Jay Turner, James F. Drake, Charles S. Osgood, Lathrop Harper, Walter M. Hill, Gabriel Wells, Carl Pforzheimer, Christopher Morley, E. Swift Newton, Chauncey Brewster Tinker, R.B. Adam, A. Edward Newton, Mitchell Kennerley, Edgar H. Wells, George H. Sargent, and E. Byrne Hackett. Newton writes of the occasion in This Book-Collecting Game, “On the fifteenth of February, 1926, my great friend and fellow Johnsonian, Mr. R. B. Adam of Buffalo, had a sale at the Anderson Galleries in New York of a portion of his library—not of his wonderful Johnson collection, but of books of which he had tired or which did not fit into the period which he has made peculiarly his own. With the idea of paying him homage, I gave a little dinner in New York, the first night of the sale, to a small group of friends and booksellers (friends also). It was a speedy affair: including speeches we were at the table just one hour and fifteen minutes. . . whereupon the meeting adjourned to the auction room” (p. 316). 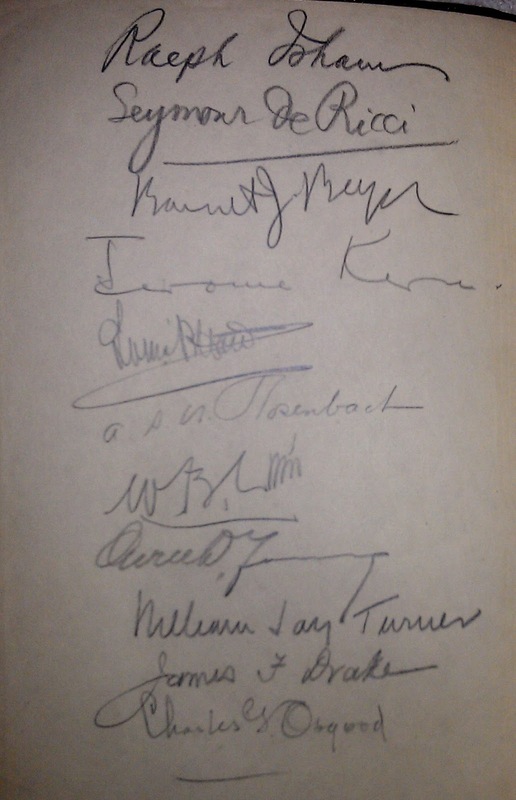 Wolf & Fleming chose to illustrate Rosenbach’s similarly signed copy in Rosenbach: A Biography (1960), with the caption, “The immortals.” They wrote about the sale: “It was one of those auctions, of which there were so many in the 1920s and so few thereafter, where the quality and rarity of the books were enhanced by the fact that collectors and dealers were universally fond of their owner. R. B.’s friends outdid themselves to pay him honor. Several of the items on which Folger gave Dr. Rosenbach bids went for ten times those bids. Once again, the Doctor represented most of the ‘boys,’ Newton, Pforzheimer, Bemis, Wilmarth Lewis beginning his methodical pursuit of Walpole, Owen Young, A. Conger Goodyear, and the broker Howard Sachs. But this sale was more than just books sold. There was a dinner party before it—the Doctor and half a dozen of the leading dealers, collectors like Kern, Pforzheimer, and Newton, Tinker of Yale and Osgood of Princeton, and, of course, Kennerley and R.B. Adam. On a copy of the catalogue of the sale which all guests signed, one wrote, ‘Si Doctor mecum quis contra nos.’” There was fun, gossip, and repartee in the galleries. And of course there was a gathering at Rosy’s afterward, where Prohibition was not. . . “ (p. 243). The pebbled limp cloth binding is original as the signers signed the pastedown and front free endpaper of it. I have a few other 1920s Anderson Galleries catalogues bound in this “deluxe” fashion—probably done in a limited number for special clients. I just obtained a copy of Rosenbach: A Boigraphy for my collection. Thanks for this information! Will be printing it and adding to my book.